Alaskan native James Church has jumped ship after numerous successful releases on his own CRL Studios and the excellent Tympanik Audio label, to the up and coming Signifier. Starting off in fine fashion, ‘Chaos’ sets the tone of what’s to come with cinematic Industrial choral pads that are infused with broken rhythms that hold an undercurrent of steadiness amongst the frenetic beats. ‘Omnicide’ starts where track one leaves off concentrating yet more on the soundtrack influences that seeped through earlier on the opening number, devoid of the breakcore-isms that I am used to with Church’s output; and once more on track three ‘Initiation’. ESA Jamie Blacker’s unmistakeable vocals filter through on ‘You are My Work in Progress’. Altogether this would have been a great track and possible contender for best on the album, but sadly the production lets everything down somewhat. There is a distinct volume drop as the voice takes precedence, rather than sitting comfortably in the mix and unfortunately the music becomes a muggy wash of electronics. 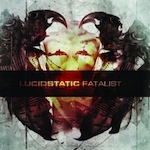 From here on in, for the most part everything follows the patter that I have come to expect of Lucidstatic and in some ways there was a comfort in this and I could relax and enjoy the ride. There are other decent guest appearances on the release and further introductions of almost sci-fi influences; ‘Fatalist’ is a stable Church interpretation of Industrial music as he sees it and is a solid album from start to finish with a few niggling volume slides on the production front that would have notched the score up somewhat if they had been ironed out before mastering.